Filipe’s 10,000 mile from Canada to Brazil will require him to cross nearly a dozen international borders. He can be seen (above) negotiating his passage into the United States from Canada. It was time to say goodbye to Nicaragua. As I rode the final 20 kilometers to the Costa Rican border with my horses, Frenchie and Bruiser, I was thankful for our lives. During my Long Ride home, my three horses and I have walked parallel to the grim reaper many times. It is a miracle that the four of us are still alive and healthy. As I arrived at the border, my girlfriend, Emma, and a friend met me with my third horse, Dude, in a trailer. He had been injured in a fall in Nicaragua. We unloaded the little mustang and he limped off the trailer and towards the busy border crossing. Emma and Dude, shortly before he was slightly injured. I have always hated the imaginary lines we call borders. I learned how much pain and confusion they can create from the age of nine when my family immigrated to Canada. This trip home on horseback has driven that hatred to a whole new level. Before I saddled up my ponies in Calgary I spent months speaking to the most renowned Long Riders in the world. They all warned me about the problems borders posed for my ride. From Canada to Brazil, I have to cross eleven of these imaginary lines, which have ended many Long Rides due to international bureaucracy. Even Aimé Tschiffely (second from the right) was continually harassed by border guards during his legendary journey from Argentina to New York. Here he is seen trying to enter Ecuador. As Emma and I walked up to a guard at the border he blew his whistle and asked us to step to the side so a truck could enter first. After inspecting the driver’s paperwork and talking to him for what seemed like an eternity, the guard waved me over. With Bruiser and Frenchie behind me, I told him I had all of the paper work to get the horses across. 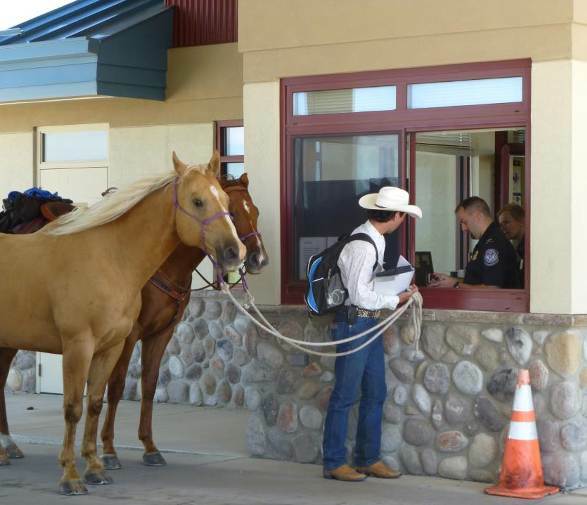 "Okay well this is not the entrance for horses, you have to go to that other gate," he said. I put my head down, started counting to 10 and made my way to the other gate. With the hot sun burning our heads, Emma and I arrived at the other gate to more whistle blowing. "No, no, no! You can’t bring horses through this gate. You must use the other one," another guard yelled. I explained to him how his partner had sent us here but he didn’t want anything to do with it. "The other gate," he yelled as I tried to explain. Felipe’s pack horse, Frenchie, grazes contentedly, unaware that a short distance away is the hostile border between Nicaragua and Costa Rica. Once again I put my head down, and counting to 10, I turned the ponies around and headed back to the first gate. "What are you doing back here? I said you need to enter through the other gate," the first guard said as I approached him. I remained as calm as I could at this point. I explained to the guard what his partner had said. He motioned for me to wait and then picked up his walkie-talkie. After arguing with his partner for several minutes he finally waved me in. "If it took us half an hour to get through the gate, imagine how long it’s going to take to clear customs," I said to Emma as we walked towards the immigration office. We didn’t need to imagine. 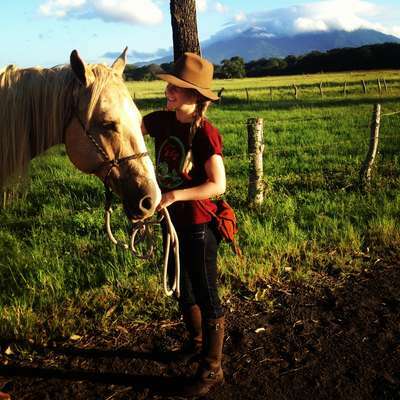 It took six hours to get clearance from Nicaragua to leave the country with my horses. It also cost me $400 US dollars; not including the $250 I had already spent on vet and lab fees the week prior to my arrival at the border. As we finally crossed over into Costa Rica I was broke and we were all exhausted. The horses and Emma were left waiting while I ran around with the blue form, the yellow form, the green form. But I was made to stand and wait for an hour while the officers ate their lunch. When they finally re-emerged we had wait for them to start the internet working again. 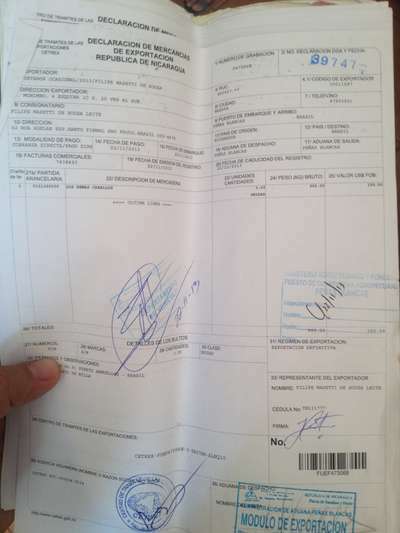 These are some of the many documents demanded by Costa Rican authorities before they would allow Filipe to bring his horses into their country. And throughout all of this, not one person even looked at my horses or inspected my pack saddle. The entire process was absolutely ridiculous. By the time we finally cleared Costa Rican customs, which was made a lot easier with the help of my friend Hector Munoz, the sun was going down. "Welcome to Costa Rica," Hector said to us as Emma and I walked towards him with our heads held low. I can’t thank Hector enough for all of his help! He drove to the border to pick up Dude and drive him to Liberia so he could rest his leg while Bruiser, Frenchie and I made the three day trek to the border. As his truck drove away with Emma and Dude, I wanted to feel excited about being in Costa Rica, but I was so drained from the border I felt like sitting on the ground and crying. Unfortunately, I still had to find a place for Bruiser, Frenchie and I to spend the night. UPDATE March 2014 – Filipe’s premonition about border troubles turned out to be accurate. 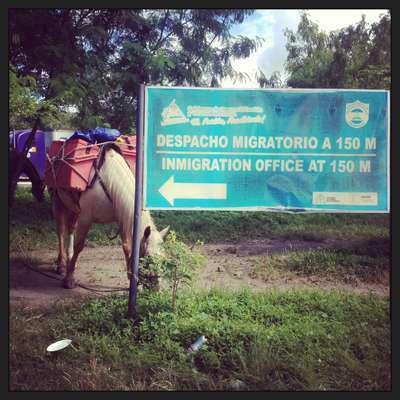 After having ridden across Costa Rica to the border of Panama, he spent weeks unsuccessfully trying to enter that country. 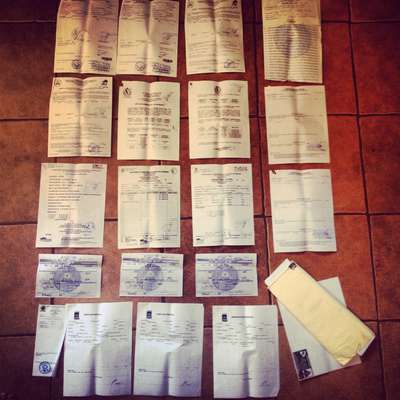 The bureaucratic obstacles were so impossible, and the legal costs so outrageous, even local politicians were unable to persuade the Panamanian authorities to allow the Long Rider entry. In an email to the Guild, Filipe reported that the Panamanians had threatened to destroy his horses if they crossed into their country. With his overland progress blocked, the frustrated Long Rider realized his journey would end in Costa Rica if he could not discover a way to transport his horses around Panama. He quickly learned that cargo ships no longer carry large animals between Central and South America. This meant he would have to transport the horses by cargo plane. But what country would welcome them? With his journey blocked by Panama, Filipe spent three months in Costa Rica, trying to arrange for his horses to be flown to South America. Peru finally granted him permission to fly his horses into their country. This expensive option would mark the first time horses were flown between Peru and Panama. Filipe and his horses were due to have landed in Peru the day this article was being prepared for publication. Then an unexpected email arrived from Costa Rica.